Gizmo, our last patient, is 7 years old with a history of bad allergies and anxiety crisis. He cannot stay in a cage because he suffers a great deal of stress then and cannot stop barking. That’s why choosing Miami Natural Pet Care to come and visit him in the comfort of his own home was the best way to go for him. 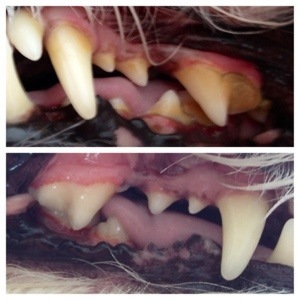 He stayed calm and thanks to the re comfort of his owner, Miami Natural Pet Care was able to remove a lot of tartar and plaque and his breathe got so much better. Large amount of bacteria is gone and it ll help Gismo to prolong her life expectancy.